4PCS x Toggle Clamp. Material: Iron. Bar Opens Angle: 90 degrees. Holding Capacity: 27Kg/ 60Lbs. Handle Opens Angle: 80 degrees. Can be used on straight shank, such as U drill, Twist drill, Center drill and extension rod. All working parts precision ground and hardened. Note: The real color of the item may be slightly different from the pictures shown on website caused by many factors such as brightness of your monitor and light brightness. Material: Metal plasticSize: 122*42mmHole dia: 12mmLength of handle: 46mmClamping range: 2-13 mmApplicable scope: suitable for the power of 1050 w above impact drill.unique patented locking function, traditional locking methods, back having ratchet teeth,the locking pieces mounted on the rear sleeve, the locking peripheral length, more effective in preventing work loose off, so that the clamp chuck,more reliably support tools.Good metallic and comfortable coat surface.Unique torque thrust bearing is easy to handle applied translate into greater clamping force.Color: black and grayPackage include: 1x drill chuckNote: Light shooting and different displays may cause the color of the item in the picture a little different from the real thing. The measurement al. You can choose corresponding holder to process lathe outside garden, lathe end face for cutting off, knurling, drilling, boring, reaming processing, etc. Use of multiple lathe toolholders form an artificial tool magazine, you can repeat to replace the toolholder. 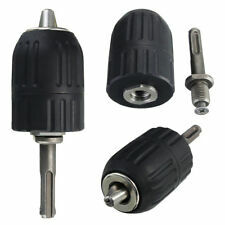 0.8-8mm Keyless Drill Chuck Screwdriver Impact Driver Adaptor. Connecting link: 6mm Hex Shank. Allows hex drive power tools to use conventional drill bits. 1 Electric Drill Chuck. Easily locks onto and releases drill bits. 12 pcs R8 collets ( 3 -22 mm ). Hardened and precision ground. Drawbar thread 7/16" - 20. Ductile Iron Base, Push Pull type, 227kg/ 500 Lbs holding capacity.Most suitable for quickly holding down sheet metal or circuit boards, for machine operation, welding, mould, electronic equipment assembly, etc field.During clamping, the lever is controlled to prevent impact on functioning due to side thrust.Plastic cover handle for easy, safe and comfortable operation. Product Name : Toggle Clamp;Model No. : GH305C;Type : Push Pull Type;Spindle Supplied : GH-SA-085012;Holding Capacity : 227Kg/ 500 LbsPlunger Stroke : 32mm/ 1.25";Hole Dia : 0.4cm/ 0.157"Weight : 339g;Color : Red, Silver Tone, BlackMaterial : Metal, Plastic;Package Content : 1 x Toggle ClampNote:Light shooting and different displays may cause the color of the item in the picture a littl. Trending at C $11.02eBay determines this price through a machine-learned model of the product's sale prices within the last 90 days. 5 x mini aluminum alloy quick change tool holder. 9 x 3/8 " drill pipe. This outstanding mini lathe set includes. -Fits 7x10, 7x12 and 7x14 mini lathes. -Hard Anodized for durability and appearance. Model: k11 80. 3-Jaw Self-Centering Lathe Chuck With Extra Jaws Machine Accessories K11-80. 1 x Lathe Chuck. Chuck type: three jaw chuck. Both side of jaw teeth and guides are ground and hardened to HRC58-62. Lathe swing: Up to 12". Turning and facing tools can be locked together. 1pc x Turning & Facing Tool Holder. Quick and easy to install. Suitable for a wide range of operations, from fine precise work to heavy duty cutting. Features: 1. Cast by high quality metal, wear resistant and anti-impact. 2. Polishing surface features anti-oxidative, waterproof and anti-corrosion. 3. Fine and strict workmanship ensures its long service life. 4. Equipped with chuck key to adjust the chuck for proper tightness. 5. Applicable for lathe, electric drill, milling machine, etc..
Unthreaded Backplate/Adapter for 4" Lathe Chucks. For 3 & 4-jaw chucks. E does not apply as this is unthreaded. MACHINE TOOL ACCESSORIES. G is 24mm. F is 56mm. D is 10mm smooth bore. B has no threads. 15pcs x CNC ER11 collet set. Quantity: 15pcs per set. For CNC milling Lathe Tool & Workholding Engraving machine! Precision: Less than 0.012. Good elasticity, high precision. Using high quality spring steel is table in performance. 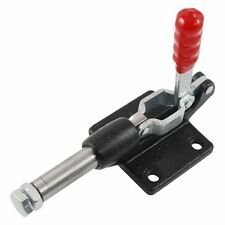 1Pcs BT30 tool holder clamp. 1 x Collet Chuck. and contraction principle to the assembly effect will be better. Clamping range:1-7 mm. We will try our best to reduce the risk of the custom duties. In order to improve the accuracy and back-end aperture small than 6.35mm, directly mounted. Complete set with key & adaptor. 1pc x key & adaptor. Type: drill chuck. 1pc x drill chuck. Chuck range: approx. 1-10mm/0.039"-0.39". We will try our best to solve the issue. MWLNR2020K08 Holder. 1 x MWLNR2020K08 Holder. 2 x Wrench. -For high hardness materials and cast iron. such as cast iron also has good features. Quantity: 10pcs/box. Model: WNMG080404. Blade color: Gold. 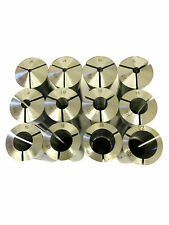 10pcs/set ER20 Spring Collet Set For CNC Workholding Engraving & milling Lathe Tool. Model: ER20. 10x ER20 Collets. Collet must be placed into collet chuck nut before inserting into collet chuck. - Widely used, boring, milling, drilling, silk attack, sculpture, CNC, and other processing. Accept Insert :MGMN200. Grooving Width:2mm. 1x L Wrench. Shank : 12 12mm. 1 x MGEHR1212-2 Tool Holder. Total length : 100mm. 6330 Milling Machine Vise Fixture Precision 2 Axis Cross Work Table for Bench Drill Product Description: The table applies to mini bench drill and drill bracket series. It can also be applied to other suitable machine. The bench is made up of several adjustable dovetail aluminum alloy, We can guarantee a minimum of space and to ensure accuracy. ★Mini multifunctional working table 6330.The table is suitable for mini drill and drill bracket series. It can also be applied to other suitable machines. ★The work table is composed of several adjustable dovetail slot aluminum alloy composition, can guarantee the minimum space and ensure the accuracy. ★Table size: 330 × 95mm ★Adjustment in X direction: 200mm. Adjustment in Y direction: 65 mm. Distance between grooves : 34mm ★Hand wheel with ad. 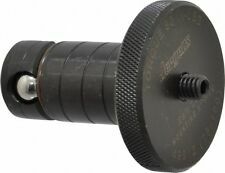 1 Set x Arbor Mandrel Adaptor(5Pcs/Set). Allow for use of cut off wheels with a 16mm - 20mm hole. Due to the difference between different monitors, the picture may not reflect the actual color of the item. 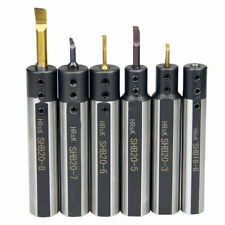 Is an alternative to traditional square tool holder, realizing fast turning which is the ideal product. 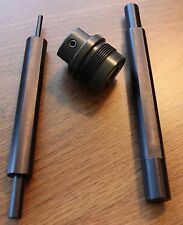 2x 1/4-3/8"Turning & facing holder. 1x 3/8" Boring holder. 1x 1/2" Capacity cut-off blade holder. Model: SNR0010K11. 1 x SNR0010K11 Holder. Wrench length: about 83mm. 1 x Wrench. Insert:(10pcs) 11IR A60 Inserts. It can reduce the tool grinding cost and improve the cutting efficiency;. 10 x 11IR A60 Inserts. Trending at C $18.30eBay determines this price through a machine-learned model of the product's sale prices within the last 90 days. Drill Bit Chuck Quick Change Adapter Converter Description: 100% High quality and Brand new. Mini Electric Grinding Drill Chuck/Wind Electric Screwdriver Universal Chuck /Engraving Machine Conversion Chuck Engraving Machine Conversion Chuck Adapter For Power Impact Driver Clamping Range:Dia 0.3-3.4mm Connecting Shaft/Connecting Rod :Dia 2.35mm Material:Alloy Note: Do Not Operate It High Speed Directly After Mounted On Universal Chuck, Otherwsie Rear Axle Will Be Bending. The Correct Use Of The Method Is: First, Adjust The Governor Speed In The "Minimum Or 0 Revolutions", Then Turn On The Power , And Then Adjust The Speed, Speed Is Not Too High!!! Preferably Not More Than 1w Revolutions. 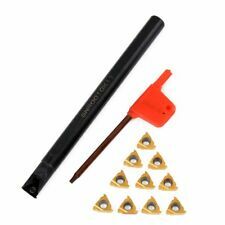 Package Included: 1 X 0.3-3.4mm Drill bit chuck adapter. Trending at C $4.05eBay determines this price through a machine-learned model of the product's sale prices within the last 90 days. Blade Height : 32 mm. 1xSPB32-3 Cut-Off Blade. We will try our best to reduce the risk of the custom duties. - Cut neat appearance, high efficiency. Suitable Holder: SMBB1632/2032/2532. Please add this item to your watch list so that you can receive price update about it via email. Here is how: Click the Add to Watch List button under the Place bid or Buy It Now button. Name:Drill Chuck Model:638935 Specifications: Fit For:5mm motor shaft Color:gray black Materials:alloy steel Clamping Range:1. MCLNR1616H12 --1PCS for CN1204 insert. MWLNR1616H08--1PCS for WN0804 inser. MTJNR1616H16---1PCS for TN1604 insert. SHIM CN1204------10PCS. SHIM WN0804----10PCS. SHIM TN16-------10PCS. Toggle Clamp GH-201A 201-A Horizontal Hold. Quantity: 4pcs. It is a useful and Quick Hand Tool Release. USA, Canada, United Kingdom, Austrilia, France, Germany, Spain, Ireland, Italy, Others. Canada, United Kingdom, Austrilia, France, Germany, Spain, Ireland, Italy, Others. Hardened and precision ground. Made of high grade specially formulated spring steel. Gripping range: 1mm to 13mm (1mm, 2mm, 3mm, 4mm, 5mm, 6mm, 7mm, 8mm, 9mm, 10mm, 11mm, 12mm, 13mm). Portable size with long service life. Center: MT2 Morse No. 2 Taper. Centre Height: 65mm. 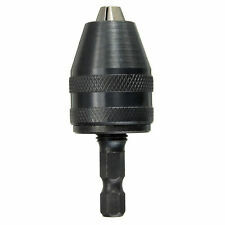 Suitable for a 4-Way Chuck Key Large for Drill Presses 1/2" 9/16" 5/8" 11/16". 1 x 4-Way Drill Press Chuck Key. Color: black. Detail Image. Canada, United Kingdom, Austrilia, France, Germany, Spain, Ireland, Italy, Others. BOSTAR 5C Collet Chuck With Integral D1 - 4 Cam Lock Mounting. Can Use Any Size 5C Collet From 1/16 through 1-1/8". Scroll and Pinion Design just like 3-Jaw Chuck, Operated With Chuck Kay. Threaded 7/8'' x 20 per inch. Size: 1/2'' Straight Shank. For the Boring Head 2'' #0350-0002. Accusize Industrial Tools. Machines, and other processing. (with ER16 nut and supporting the use.). Model: ER16 (10pcs,1mm-10mm). 10pcs ER16 Spring Collet. widely used in machining centers, general milling machines, CNC milling machine, engraving machine, high-speed. Accept Insert :MGMN200. Grooving Width:2mm. MTJNR2020K16 20x125mm Lathe CNC Turning Tool Holder For TNMG 1604 2 Spanner. SCLCL1212H06 95° Left Hand Lathe Turning Tool Holder w/CCMT0602 Insert Spanner. All of our inventory is new and unused unless otherwise noted. EXCELLENT SERVICE. Model: ER32. These spring collets are made of high quality 65Mn spring steel for CNC milling lathe tool and work-holding engraving machine. Collet must be placed into collet chuck nut before inserting into collet chuck. 1/4" SUPER PRECISION ER11 COLLET CNC CHUCK MILL Top Quality. The most accurate ER11 collet in the industry- average 0.0002” Total Indicated Runout (T.I.R.)! SPINDLE MOTOR AND INVERTER VFD. 3/8"SUPER PRECISION ER20 COLLET CNC CHUCK MILL Top Quality. 1 x Collet Cone. Color: as shown in picture. USA, Canada, United Kingdom, Austrilia, France, Germany, Spain, Ireland, Italy, Others. Canada, United Kingdom, Austrilia, France, Germany, Spain, Ireland, Italy, Others. Insert: MGMN200 (10pcs). Grooving width: approx. 1 x Wrench. 1 x MGIVR2016-2 Turning Tool Holder. MCLNR1616H12 16×100mm Index External Lathe Turning Holder For CNMG1204 inserts. S16Q-MCLNR12 HOLDER 16×180mm for CNMG1204/CNMM1204/04/08/12/16 Hole lathe. For milling machine, lathe, drilling machine, wood working machine. The shank with scrw can be tight and flex for you. 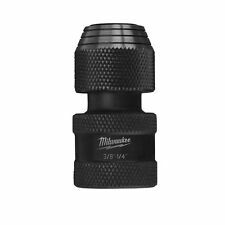 Should work with power drill, here is not included color:silver tone ,black Interior Hole Diameter : 16mm Body Diameter : 42mm/1.65"; Total Height : 55cm/ 2.2" Chuck Key : 8 x 4cm/3.1" x 1.5" (L*W) Brand Unbranded MPN Does not apply UPC 4894462391952 MPN Does not apply. Trending at C $10.15eBay determines this price through a machine-learned model of the product's sale prices within the last 90 days.